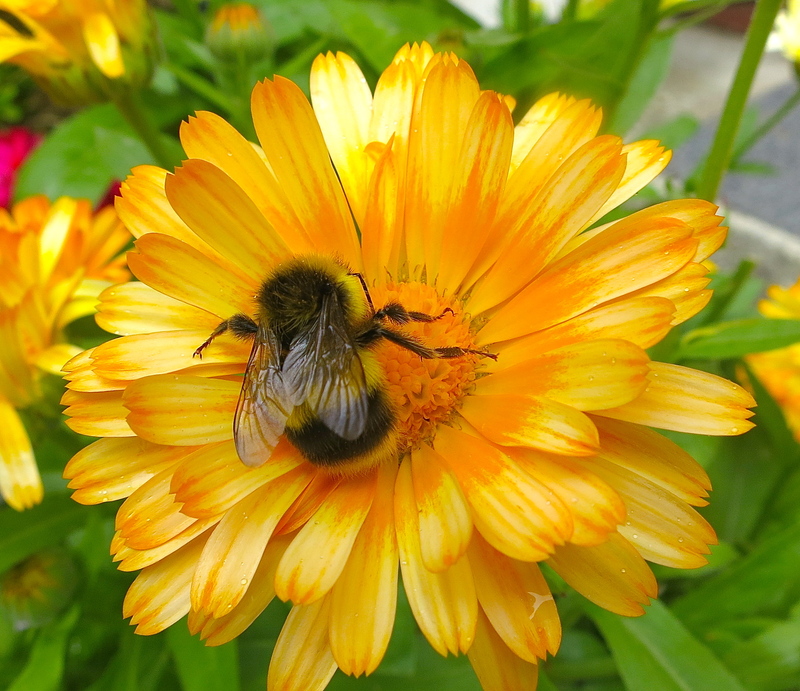 Despite there being little sun and a quantity of intermittent rain today, bees were busy harvesting nectar from Jackie’s plants. 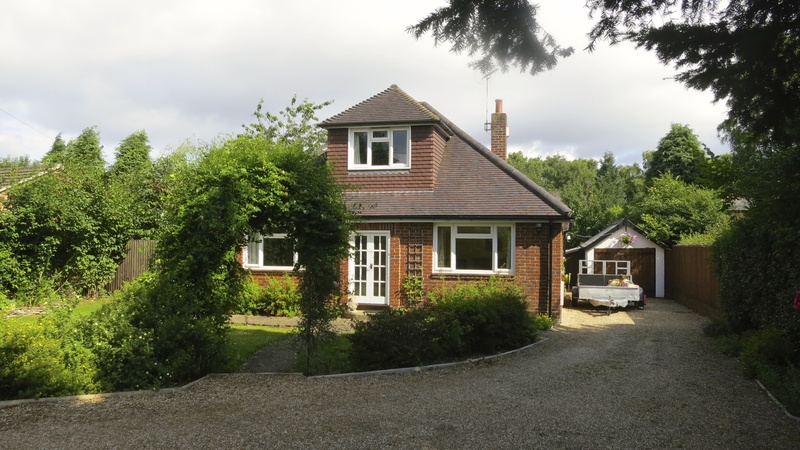 Minstead Lodge’s horses were favoured with fly-sheets. Their companion donkeys were not. Maybe they are not as plagued by the little nippers as are the larger animals. I moved into 29 Sutherland Place in July 2007. Soon after this, a small child pointed out the camera integral to my i-Mac computer, and that this was a wizard way of taking your own picture. Much fun was had by Oliver and Alice in particular, and many hours were spent playing with the special effects that could be achieved, especially if you were prepared to pull funny faces. 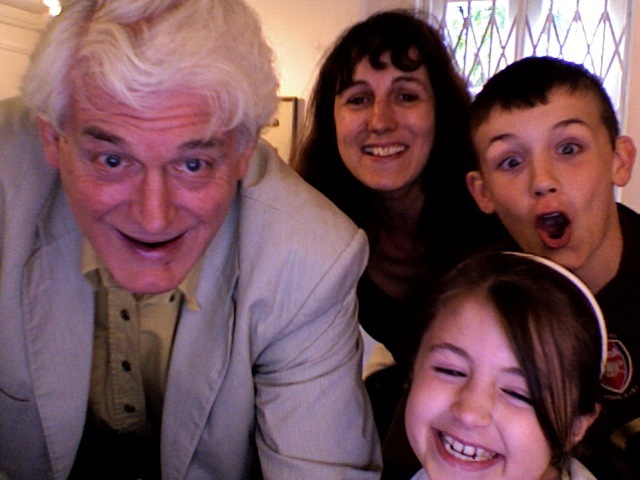 On 30th July, Heidi, Oliver, Alice, and I had a very fruitful session. I seem to have cut my chin shaving. 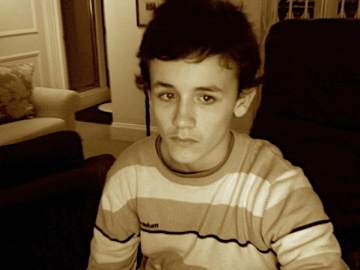 By 15th November 2008, Oliver had become quite proficient. This I discovered some time later when I found a couple of dozen mixed colour, and distorted effect pictures planted in the computer. 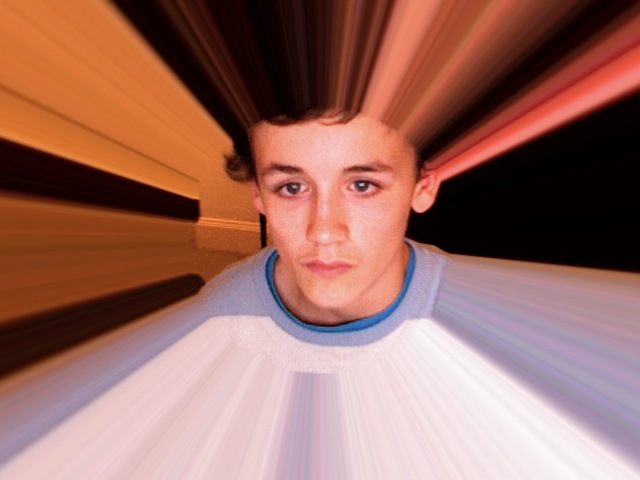 By December 2009, Louisa had persuaded me into Skype, and I believe I actually took picture number 23 in the ‘through the ages’ series whilst I was Skyping her. I was certainly speaking with her on the phone. 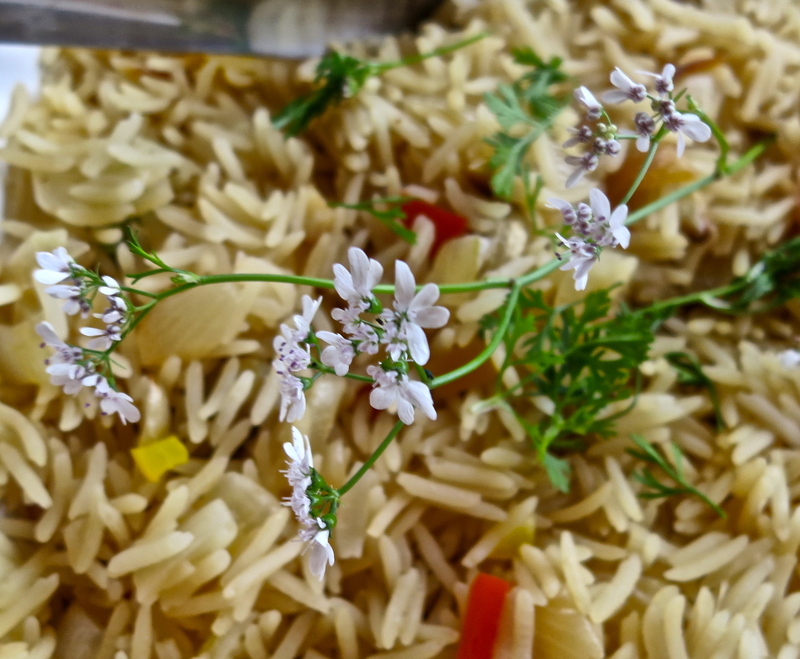 The coriander garnish decorating Jackie’s tasty savoury rice that she served up with her delicious chicken jalfrezi, accompanied by popadoms and paratas from a little shop in New Milton, was in bloom. That is the result of growing the herb in pots and not using it quickly enough. It does mean we will have plenty of seeds for next year. With my meal I finished the Cotes du Rhone opened a day or so ago. Have you ever coughed or otherwise breathed in at an awkward moment when eating, and wound up with a pea firmly lodged in a part of your respiratory system? It usually irritates somewhere between the back of your throat and your nostrils, until eventually you blow it out into your handkerchief. Well, I’ll let you know in good time whether mine of this evening is a grain of rice or indeed a pea. Ron Sveden from Massachusetts once ate a pea that ‘went down the wrong way’. Jackie read out his story from BBC news the other day. It was in August 2010 that he was rushed to hospital with a collapsed lung. He feared cancer until the doctors informed him that he had a pea plant growing inside his lung. If I should be nurturing a paddy field I will report that too. Early this miserably wet morning, Michael drove me from Minstead to East Croydon where I caught the train for Victoria for my next Sutherland Place book packing trip. We stopped at Fleet service station on the M3 for my son to have breakfast and each of us coffee in Starbucks. Michael had finished his porridge before we received lukewarm insipid beverages. These were sent back and changed. Noticing the driblets, some of which were hardened, on the sides of Michael’s mug, I said I hoped this was because they had re-used our original ones. Then I noticed the lipstick on mine. Back they went. The server told me that they had used the first cups again. When I pointed out the lipstick, he did not persist. Our third receptacles also contained external driblets, but they at least seemed reasonably fresh. We drank them. Not to be recommended. As we crawled through Hooley on the continuation of our journey, I began to feel that urination would be in order. Michael spotted another Starbucks. As we’d taken the coffee on board in one of their establishments it seemed only reasonable to jettison it in another. Entering this outlet our nostrils were assailed by the pungent aroma of burning. Vaguely wondering whether someone’s breakfast was a bit charred, we approached the toilets in a far distant corner. The Disabled and Gents doors bore ‘Out of Order’ signs. Rammed into the upper corners of these were small cardboard handprinted notices. The Gents one informed us that the facilities were useable but dusty. Having negotiated the outstretched kneeling legs of a man with his head under a washbasin; about half a dozen large workmen’s boxes of tools; various lengths of copper piping; and broken pieces of porcelain, it was possible, one at a time, to enter a cluttered WC for which the word dusty was definitely an euphemism. It was, nevertheless, useable, as the various quantities of sticky looking yellow liquid bearing a smattering of curly hairs around the rim of the seat and the floor bore witness to. Passing the time of day with the crouching plumber we realised that his burner was responsible for the unappetising scent that pervaded the eating area. 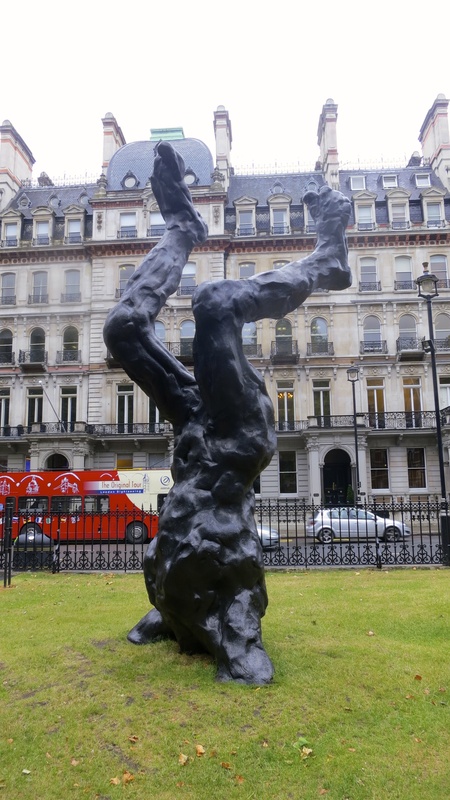 From Victoria I walked in steady rain to Hyde Park Corner where I boarded a 52 bus. 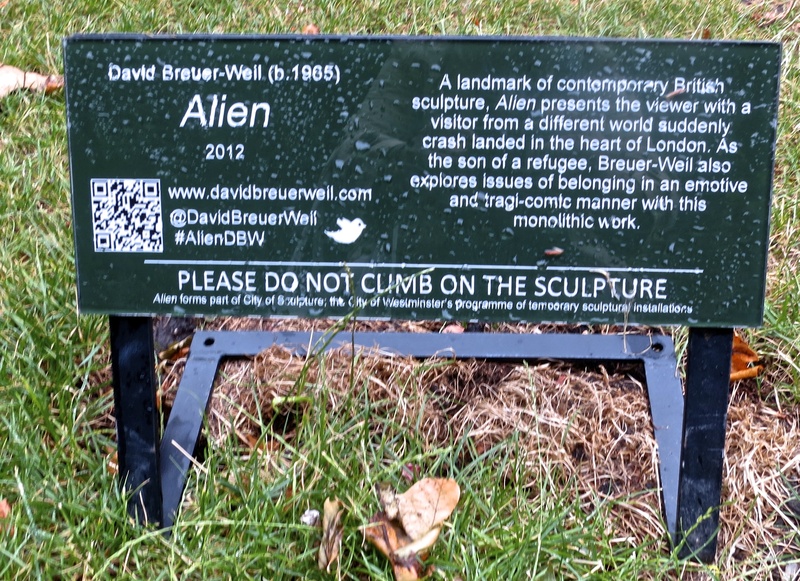 An Alien sculpture has, since last summer, descended into the grass in Lower Grosvenor Gardens. 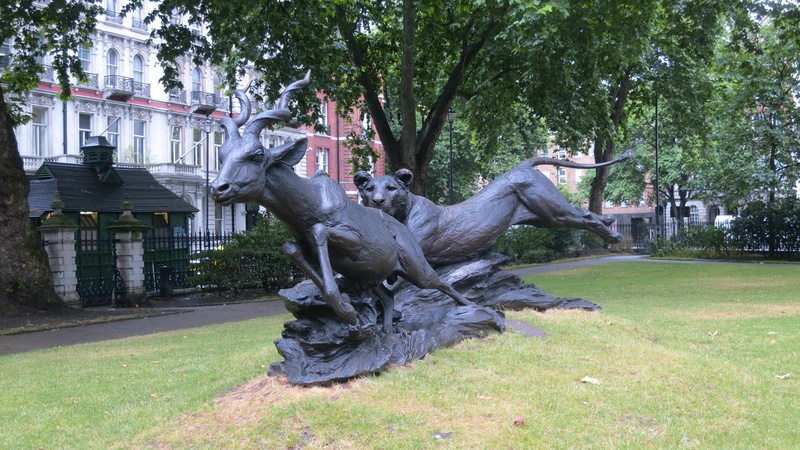 This contrasts with the more traditional chase represented in a small green opposite the Queen’s well-defended back garden which stretches the length of Grosvenor Place. The doors of the bus closed on a young woman attempting to leave as she negotiated the high kerb with her buggy. Her cry of alarm caused the driver to open them in order for her to continue her struggle. 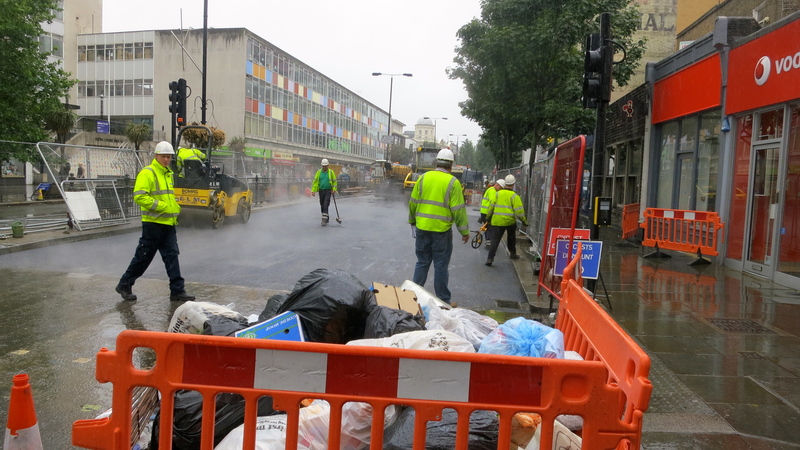 Extensive roadworks at Notting Hill Gate caused a diversion of the bus to the right towards Bayswater. This was not going to be of any use to me, so I continued on foot in much heavier rain. I walked to Queensway after the packing; travelled by tube to Waterloo; and thence by overground to Southampton Parkway where jackie collected me and drove me home. On the Central Line train I witnessed an interesting manoeuvre. There were two seats available, and far more passengers aiming for them, after I’d sat down. A middle-aged woman planted a large shopping bag on the seat next to me, and herself on the seat opposite. This prevented another woman from taking the seat unless she removed the obstacle. The first woman’s younger companion, following hastily in her tracks, picked up the bag and took the seat. I think you could say the position had been well and truly bagged. What better dinner could have been waiting for me after a strenuous day in London than Jackie’s chicken jalfrezi and savoury rice followed by her home-made trifle? We thoroughly enjoyed it, as did I the Fiore di Monte merlot 2012, and Jackie her Hoegaarden. Today it was time for a big shop. In this instance that meant a trip to Totton for Lidl and Asda. On the way we diverted to Copythorne to recce a house in Copythorne Crescent. The house looked good. 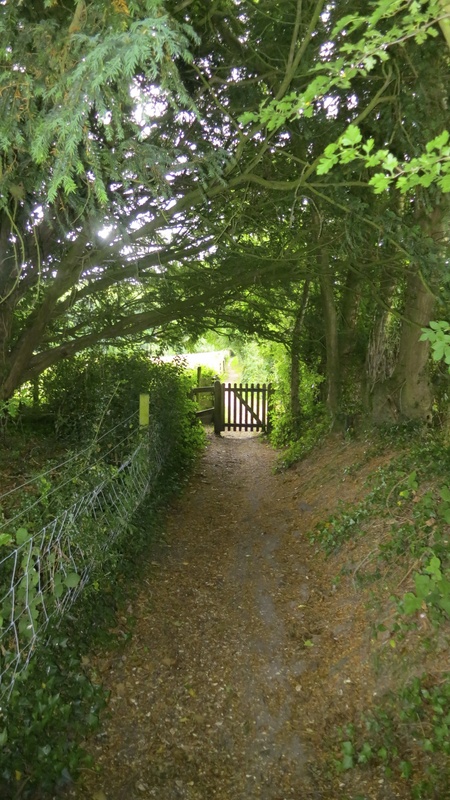 It was down a narrow unmade road with hedgerows alongside fields opposite. In one field a couple of horses were necking. There was significant road traffic noise from the M27 beyond the fields. Lidl is more compact than Asda, so shopping there was fairly straightforward. In the English owned store, we separated as I went off in search for wine to see if that is where the excellent Cotes du Rhone came from. It was, but it wasn’t on offer at 50% reduction. It cost £10.50. Jackie normally buys half price bargains. She thought she must have decided to treat me with that one. Tramping up and down the aisles in Asda, evading – not always successfully – shopping trolleys, baskets, walking aids, and slaloming children, is easily the equivalent of a decent distance walk. Why is it that no-one who suddenly stops, and reaches across the rows for an item which has caught their eye, is ever supplied with rear or wing mirrors or brake- or indicator lights? And why, whenever I take our shopping across to the car, do I always get the trolley with out of control steering? The Asda one was fine today, so it is a slight exaggeration to say that I always get the dodgy trolley, but, given that we went to two shops in one trip, it would be fair to say I always get one per journey. The Lidl one was different. It was a prime example of the need sometimes to lean heavily on one side of the carriage whilst at the same time attempting to steer it straight from the front. Today it became slightly more complicated when playing dodgems with a woman being pushed in a wheelchair. The man escorting her was an expert steerer, but he did have to allow for my veering in front of him. Eventually the couple simply stood and stared, as I struggled to prevent my steed from falling off the edge of the kerb before reaching the dropped section. Once you reach your car with these wheeled bearers it is the devil’s own job to stop them from running into your vehicle whilst you decant their contents. Like the errant shoppers in the store, they don’t have brakes. When I eventually did empty the trolley and return it to its rack, I met a couple of unforeseen obstacles. Lidl’s bays are reached by pushing the trolleys between two parallel bars. At the end of the row you are rewarded by the sight of a line of these baskets on wheels attached to the last of which is a key chain that you insert into a slot on your trolley so that your £1 deposit is spewed out for your collection. The first obstacle was a young woman leaning on the bars arguing into her electronic cheek extension who seemed to have no conception of blocking the road. I gently pressed her shoulder and pointed to my trolley. She shifted her position barely enough for me to get by without the slightest pause in her one-sided debate. Having reached the trolley rack I was ready to insert the key. I saw no slot in my handle. A brief technical examination revealed that the container for the slot was loose, cracked, and had swivelled underneath the handle. With consummate skill, I righted the pocket, inserted the key, caught the flying £1 coin, and returned to the car feeling I had just won the lottery. Michael came for a visit this afternoon and stayed over. 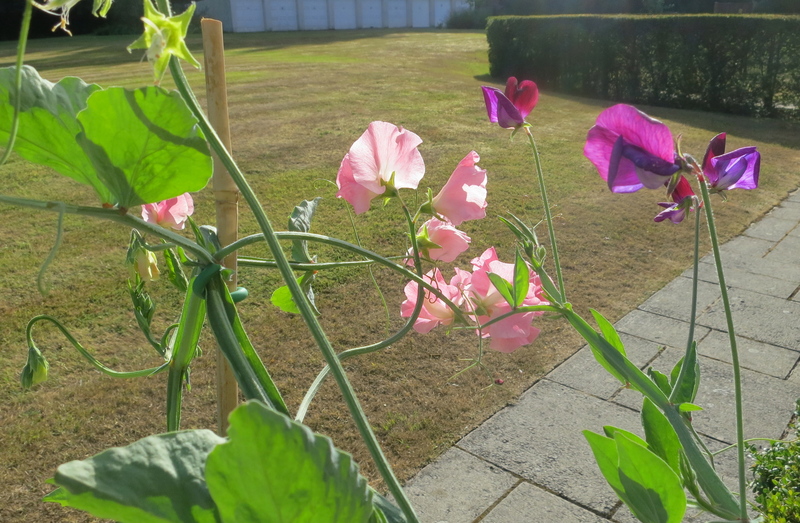 As we sat in the garden I was entranced by the late afternoon’s sun’s rays lighting up the sweet peas and other glorious flowers in Jackie’s pots. Our dinner consisted of sausage casserole, potatoes, cauliflower and cabbage; followed by apple crumble, custard, and ice cream. Michael and I drank the Cotes du Rhone while Jackie quaffed Hoegaarden. 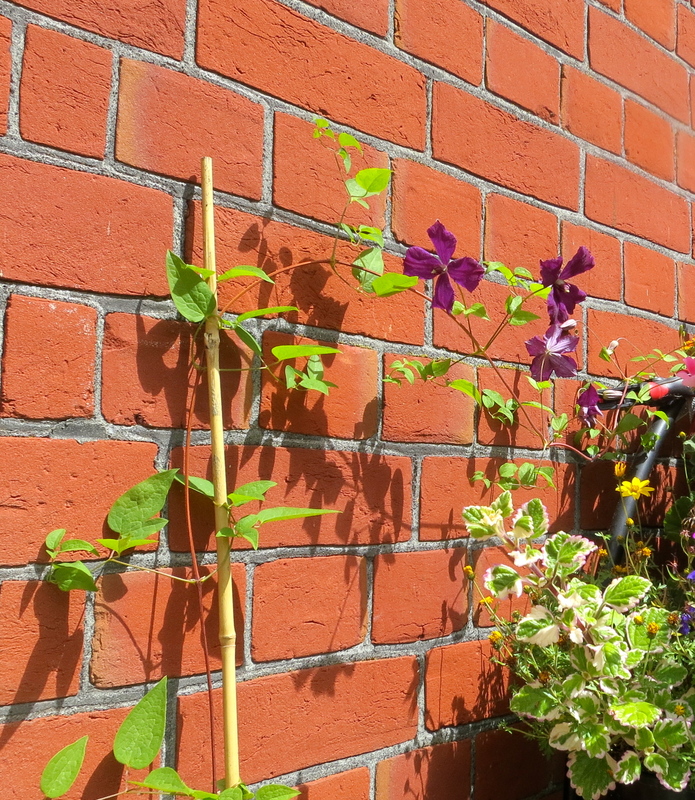 Earlier in the year, along with all her other plants, Jackie potted a couple of clematises. They seemed to be doing pretty well until they were, literally as it turned out, cut off in their prime. Each one had been snipped just above the ground. This proved a mystery until one afternoon Jackie watched a tiny mouse slipping between the bricks on which stand the invader proof fence. At each corner, exactly where the clematises have been positioned, there is just enough room for a ‘waffer thin’ rodent to squeeze through. The stems that got in his way were easily dealt with. But one of the climbers has survived. It came into bloom when we were out yesterday. 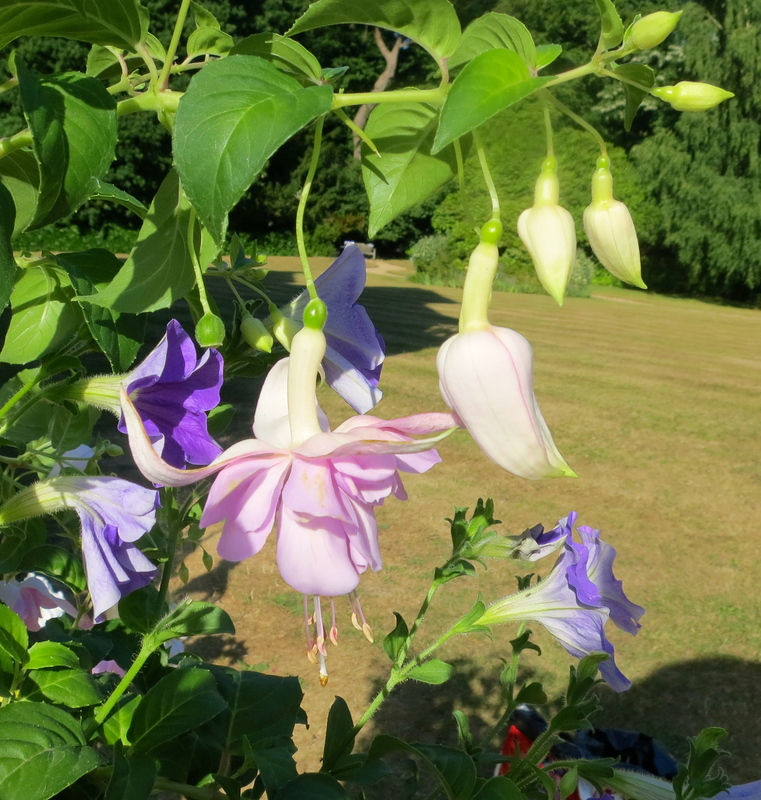 The aptly named Clematis Polish spirit showed all the qualities of that oft-beleaguered nation and regenerated itself. The story of yesterday’s rider on the lawn is that the young lady on horseback had won a prize and the not quite so young photographer was performing on behalf of a local newspaper. We are still no wiser about why our particular lawn was chosen for the photoshoot. I played hide and seek with light showers on my early evening walk in which I further explored Minstead’s public footpaths. The sound of clopping equine footsteps determined that I turned up Seamans Lane. I just missed the young woman who lives there and has several horses and carts. Continuing on I took the footpath from Bull Lane to the houses opposite the Trusty Servant Inn. This takes us between hedges separating fields with livestock in them. There is at each end a gate that can be easily opened. Crossing the road at the end, I walked up to All Saints Church and down the footpath alongside it. 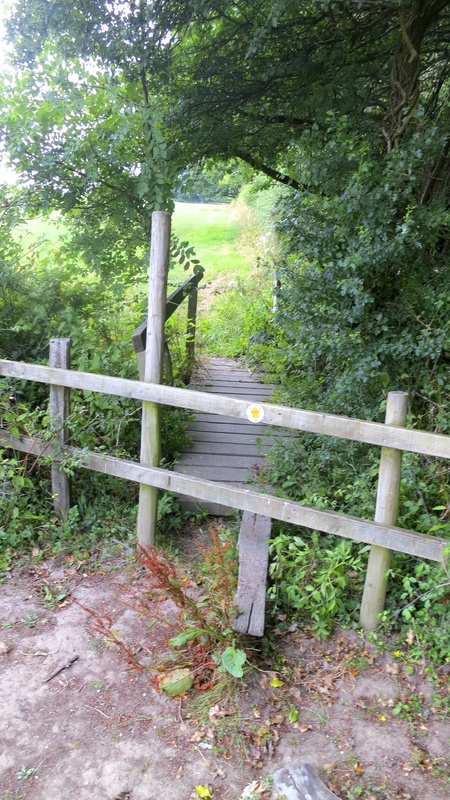 This again is accessed by two simple gates, one at the top and the other at the bottom of the slope. The path comes out near The Splash, where I crossed the road and walked up towards Furzey Gardens past the study centre. 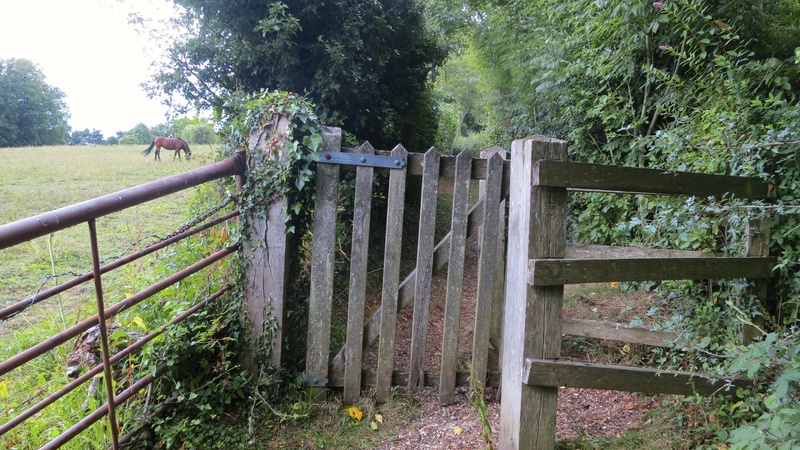 The footpath on the right hand side of this road about halfway up leads down to Audrey Saunders’s ponies’ field. It requires the negotiation of a rather rickety style held together with wire. It is in climbing stiles that I have realised that post hip replacement my left knee is not quite as flexible as it was. When I straddle these crossing places I need to grasp my left foot and force a greater genuflection than comes naturally. If, as with this one, the structure wobbles a bit one feels a certain measure of insecurity. For some reason, this all reminds me of walking with the dogs. The dogs in this case were Jessica’s Collie/Labrador cross, Paddy, and Ali and Steve’s Golden Retriever, Petra. We had to pass through a gate alongside a river or canal in a place I disremember where. Paddy, as usual, squeezed and wriggled her way through, wet-nosing anything that hindered her. Petra, equally as usual, wouldn’t chance it. She stood, head down, sheepishly waiting for someone either to widen the gateway, or to lift her up. 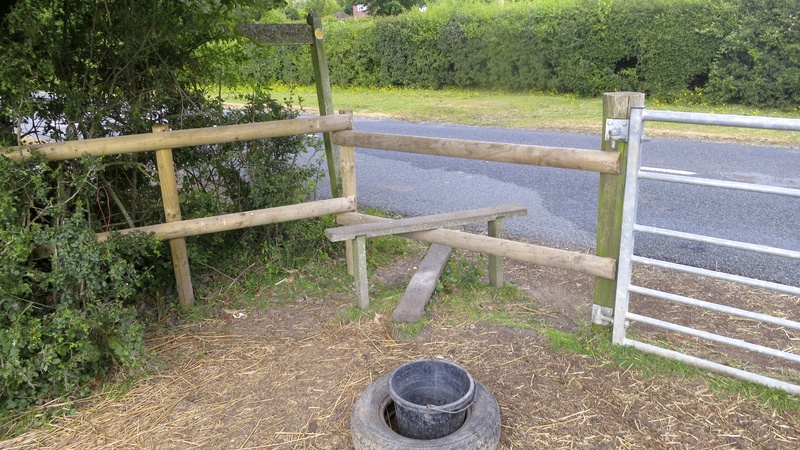 The most stable stile today was the one that leads back onto the road through Minstead from Primrose and Champion’s field. After the walk I was fed by Jackie with succulent sausage casserole and ratatouille; sausages courtesy of Helen and Bill, and courgettes courtesy of Heather and Brian. I drank a couple of glasses of Vinsobres Cotes du Rhone 2011. It is a great pity Jackie can’t remember where she bought the wine, because it is excellent. 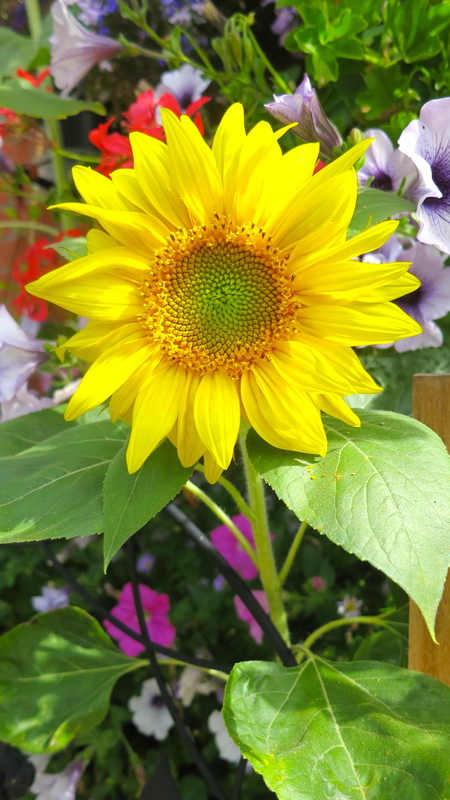 The sunflowers seeded in Jackie’s pots by birds, no doubt as a reward for her feeding them, have came into bloom today. They are rather like cuckoos in that they are planted in someone else’s nest. I don’t think, however, that they have pushed out any other flowers. 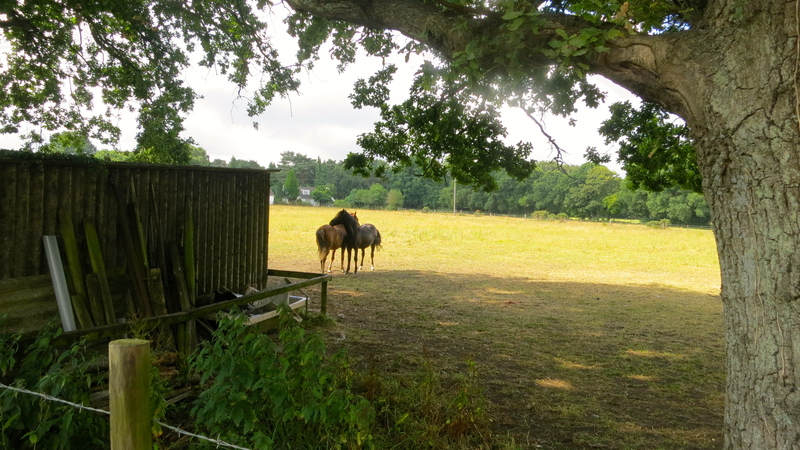 Just before we left for Mat and Tess’s, I heard a neighing coming, I thought, from a pony that must have found its way over one of the cattle grids. ‘Good grief!’ exclaimed Jackie when she saw the source of the sound. 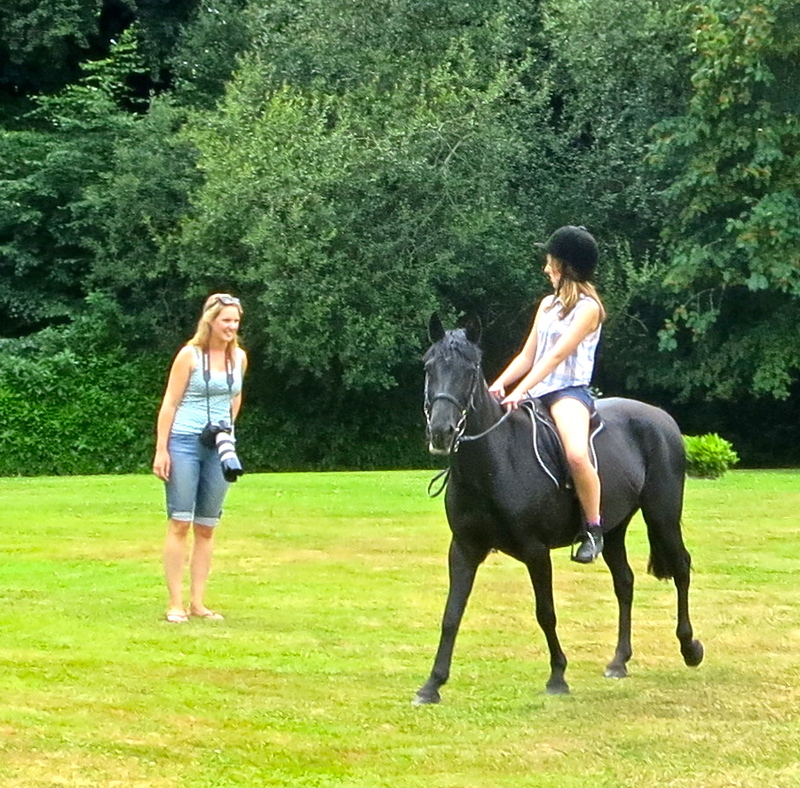 A child, accompanied by a woman with a very long lensed camera, was riding a largish foal around our lawn. We could only assume these were visitors to other residents. We didn’t have time to investigate. On 12th May and 20th October last year I described how Tess Flower, our daughter-in-law, proprietor of The Village Shop in East Sussex’s Upper Dicker, has transformed the establishment and consequently the lives of her customers. Her numerous innovations have fostered social relationships and made ‘Care in the Community’ mean something real. This has not been without considerable opposition from killjoys. The shop lies at the end of the small village green. A few objectors to almost every event she has introduced spread fears of rowdiness and late night noise, none of which ever takes place. The cafe area of the shop closes in good time for people to sleep. The only sounds are from the muted music and gentle hubbub of civilised conversation within the confines of her building. 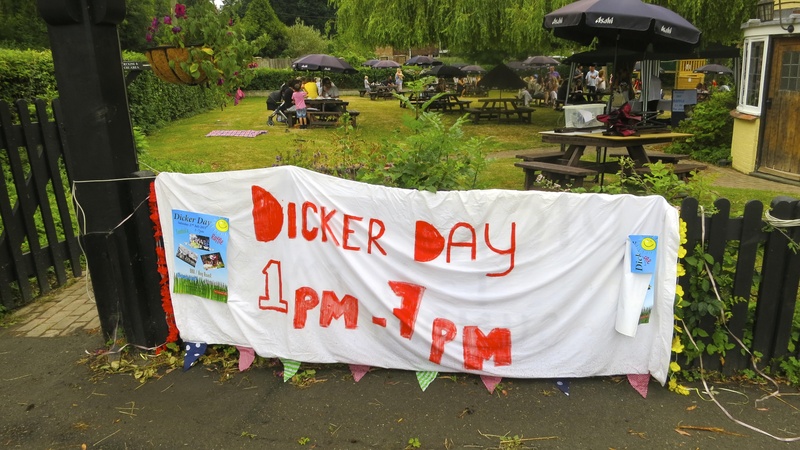 Some years ago, to the delight of the long established residents, Tess reinstated the defunct annual Dicker Day. Those few incomers who have no idea of what a village green is all about, made their usual objections. The event has fortunately been revived by the new owners of The Plough Inn, who are hosting it this year. Tess is generous in her support of this. The fact that today’s event was beset by, at times, torrential rain did not deter the crowds that had come to The Dicker from the surrounding areas. It had a slightly different flavour from earlier times, but doubtless benefitted from the shelter provided by the pub. The numerous garden tables all had generously proportioned umbrellas attached. Unfortunately the one I sat under dripped steadily onto my jacket. Tess told me that the new publicans have thought of everything. There is even a basket of blankets for those feeling the evening chill. The banner announcing the event got a bit soggy, but at least the colour didn’t run. There was a bouncy castle; a raffle; face painting; and a lively young female singer. A hog roast and burgers were obtainable during the day and the meals we enjoyed in the evening lived up to Tess’s billing. As I said to Peter, the new proprietor, any food Tess praises is bound to be excellent. He certainly values her judgement as much as we do. We didn’t arrive home in time for me to post this on the day, so I am doing it the next morning. As far as I can remember starters were a spicy carrot soup for me; pate for Mat; some kind of pancake roll for Tess; and halloumi for Jackie. Our main courses were haddock and chips for Tess and me; burger for Mat; and salmon and cod fish cakes for Jackie. Summer and sticky toffee puddings and a cheeseboard followed. Becky and Ian, somewhat tardy, joined us while we were on our desserts. It was a good thing they brought their dog Scooby along, because he did a good job of dislodging and disposing of the piece of Tess’s cheese that had found its way into my sandal. It saved me from the difficulty of getting down under the table. Peter made up a small portion melange for Becky. Ian enjoyed his asparagus and peas risotto. I can’t be sure who drank what, but there were a couple of bottles of New Zealand Marlborough pinot noir; some white wine; and various beers dispensed. Somehow Jackie was able heroically to stay awake for her two hour drive back to Minstead, which is more that I did, although I did manage, intermittently, to keep her company. This afternoon we visited Elizabeth at The Firs. I delivered the prints for the summer exhibition and we telephoned her framer to discuss framing my pictures. We had hoped to get down to gardening, but all felt pretty lethargic because it was still rather hot and humid. We did get some watering and treating of diseased heuchera done; some pruning of wisteria; and some pondering. After the several weeks’ heat-wave everything was looking rather autumnal. I have written several times about Oddie’s penchant for snaffling my chair. 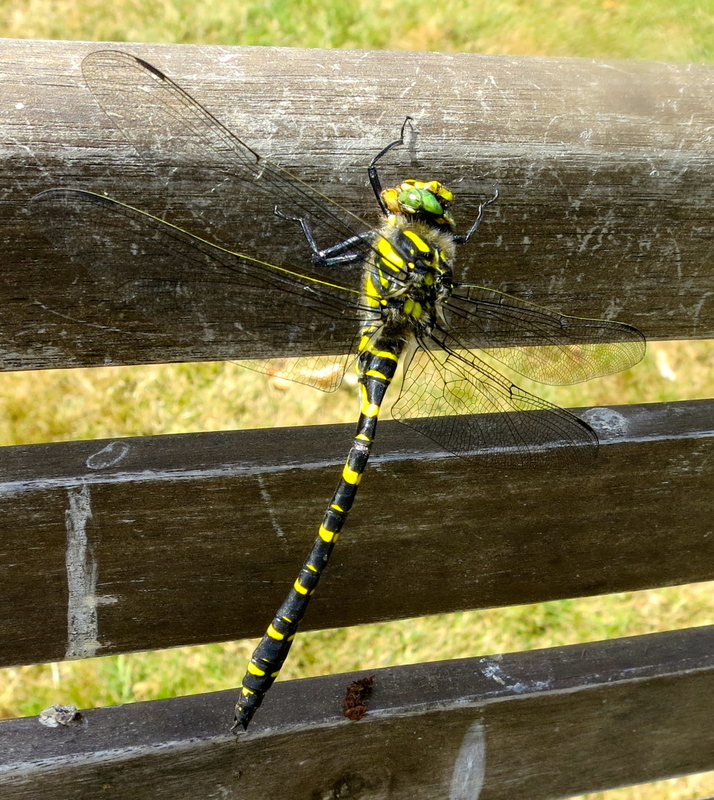 A dog is one thing, but a dragonfly is something else. 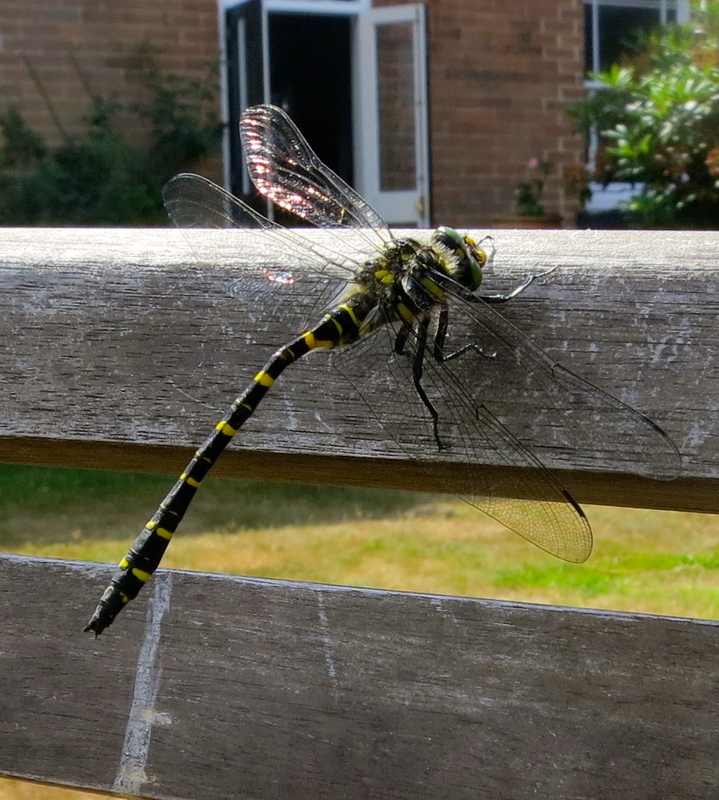 Our visitor calmy took up its position, mandibles munching away, refusing to budge until it was ready. 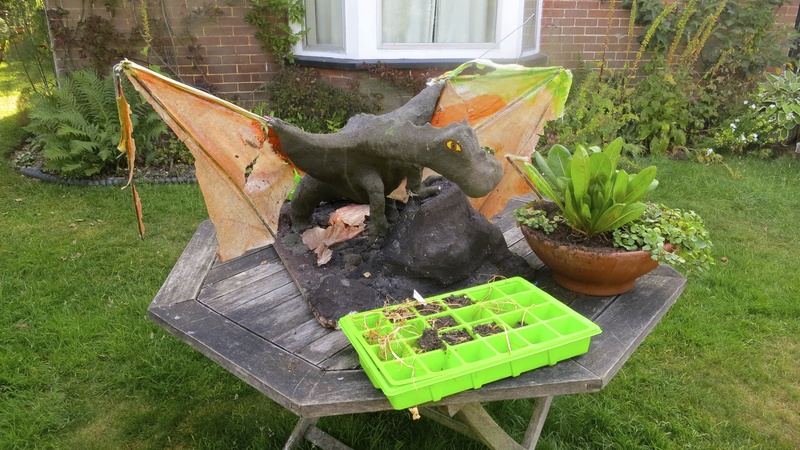 Adam’s GCSE dragon kept a watchful eye on its enormous living relative. I have never seen such a large specimen before. 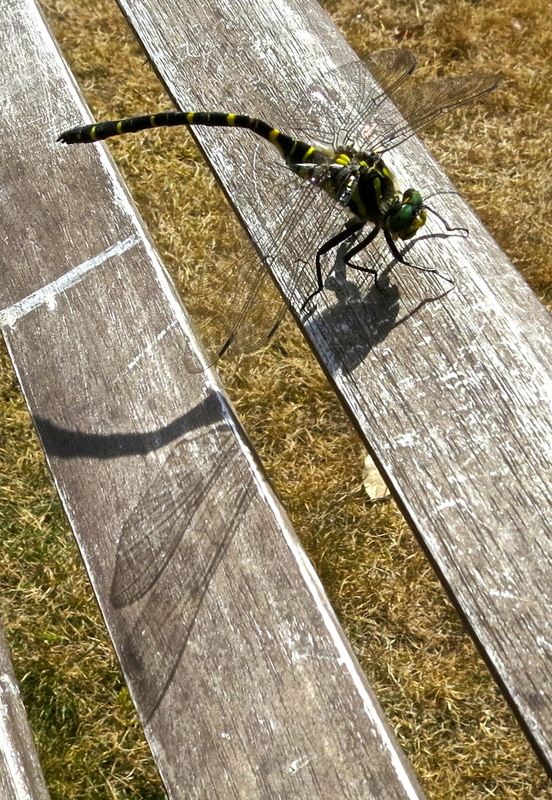 What I’ve always thought of as a dragonfly has simply been a small blue damselfly. The plan was for Elizabeth, Danni, and Andy to join us for an Eastern Nights meal in Thornhill. There was some delay as my niece and her boyfriend were delayed by a traffic accident and a heath fire. 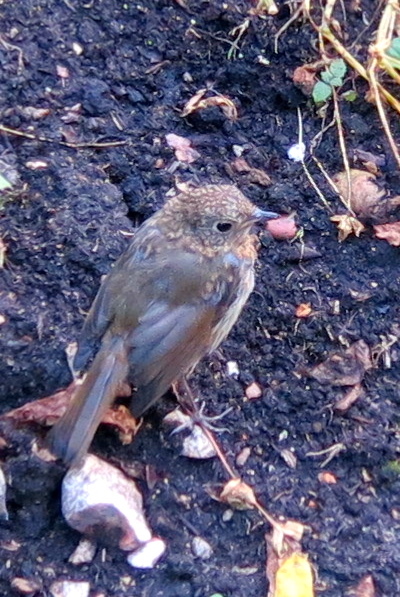 While the rest of us sat in the garden waiting for them, a member of the next generation of The Firs robins hopped around us, following in the clawsteps of our companion of last summer. The curries were of the usual high standard at our favourite Hampshire Indian restaurant. Bangla, Cobra, and Coke were drunk. 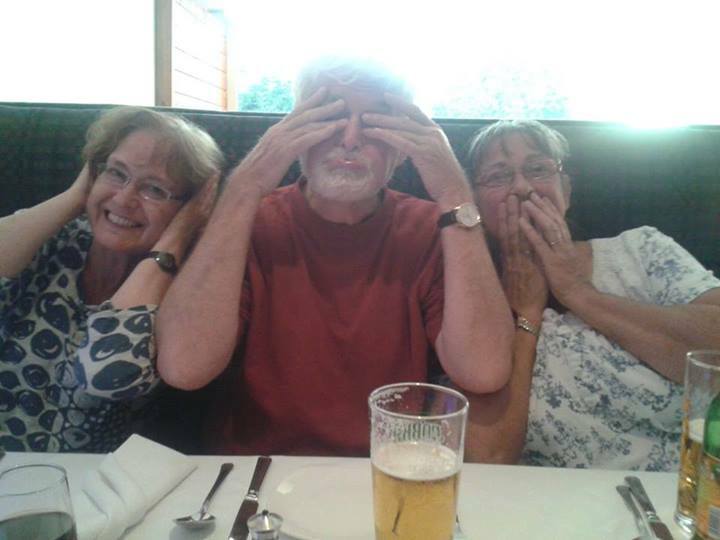 Danni took a photograph of what she termed the three wise monkeys. Light rain began to fall just as I left home to repeat the walk I had taken with Matthew and Oddie on 7th. This precipitation was to take the form of intermittent showers for the first three quarters of an hour or so. 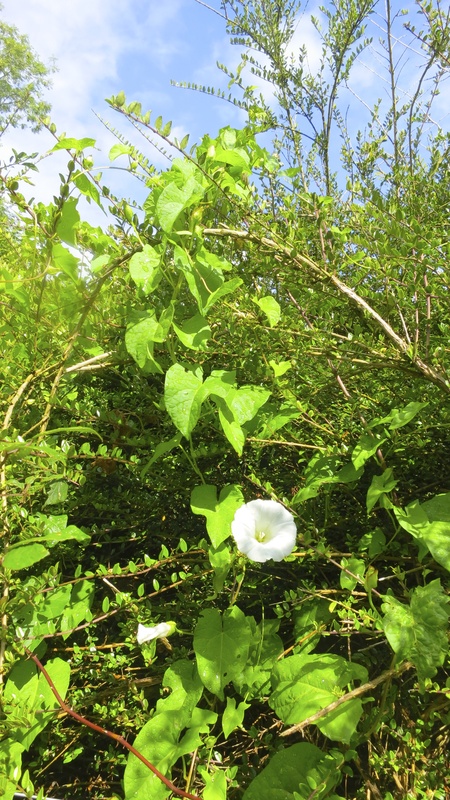 During the few periods when the sun pierced the grey cloud cover, the hedgerows, now counting convulvulus among their constituents, glistened with the raindrops. Not having the excuse of Mat’s ageing little terrier to call Jackie to collect me from the bottle bank, I had to walk the final stretch up Running Hill as well. 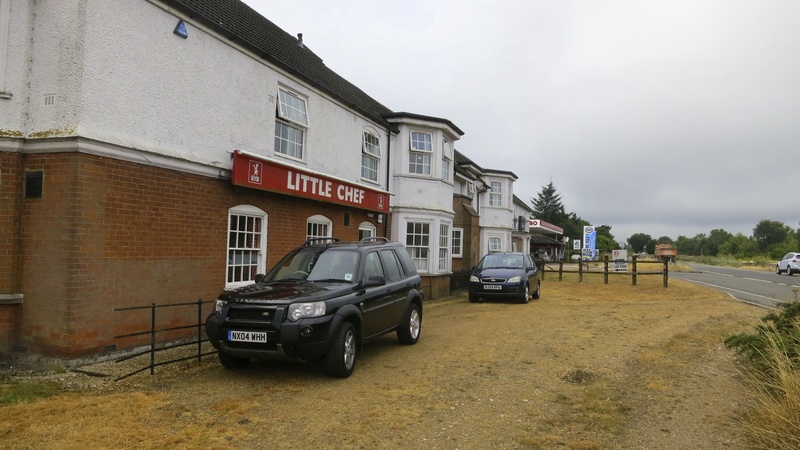 Once I had emerged from the forest at Little Chef I was alongside the A31 for a short time. I passed that building, the Travelodge, the Esso garage and various houses which are found roughly at the area where the signs to Stoney Cross bring the hopeful traveller. What is now a major East/West dual carriageway has very little in the way of pedestrian thoroughfares. 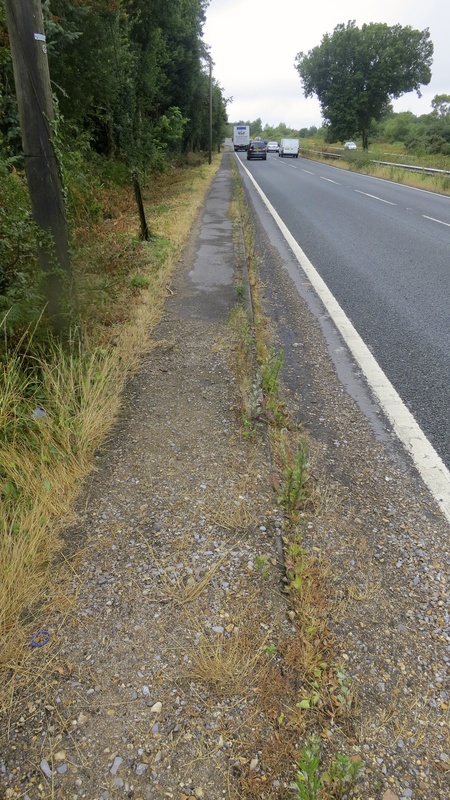 The derelict footpath from just past the Esso garage to Forest Road betrays the fact that ordinary people without cars once trod this way. Now it is only people like me who venture along it. A row of hardy hollyhocks, having escaped to the central reservation, clung to the thin soil as passing vehicles did their best to create enough turbulence to tear them up. 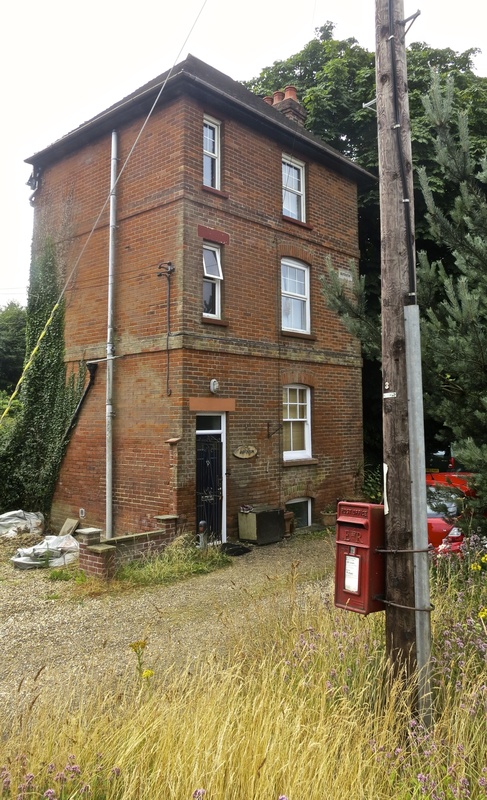 I exchanged waves with a woman working in a garden not far from a tall, isolated, house called Rufuston that seems to have its own Royal Mail collection box. The name must come from the nearby Rufus Stone (see post of 19th November last year). As I reached this house I paused to photograph it. The woman tentatively, with a quizzical look, approached me from my left. She wondered why I was taking photographs. It seemed a reasonable question really, especially as it was her house whose image I had just pocketed. My explanation of what I was up to must have reassured her, for we parted pleasantly and she expressed the wish that the weather would stay fine for the rest of my walk. At the bottom of the hill that leads from The Splash to the Furzey Gardens junction, Tim was digging mud out of the ditch that leads to his farm. This trench joins a pipe that runs under the road. Like the ditch, the pipe was full of soggy earth. 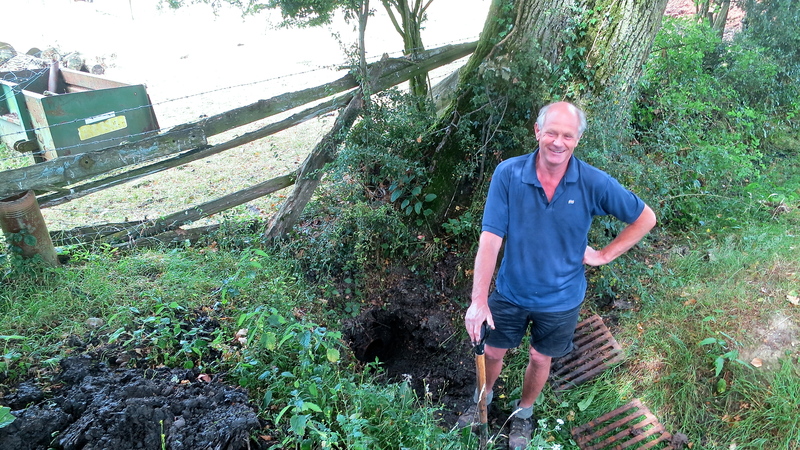 Tim was working to clear as much as he could from the ditch and the underground pipe. I have before wondered whether there was a machine to carry out this task. If there is, Tim wasn’t aware of it as he plied his garden fork. Although the farm is his, he said the land on which the road lies belongs to the manor, the owners of which, in his view are responsible for the clearance. Apparently in the old days there was a villager with a technical title Tim couldn’t remember, whose job it was to keep the ditches clear. 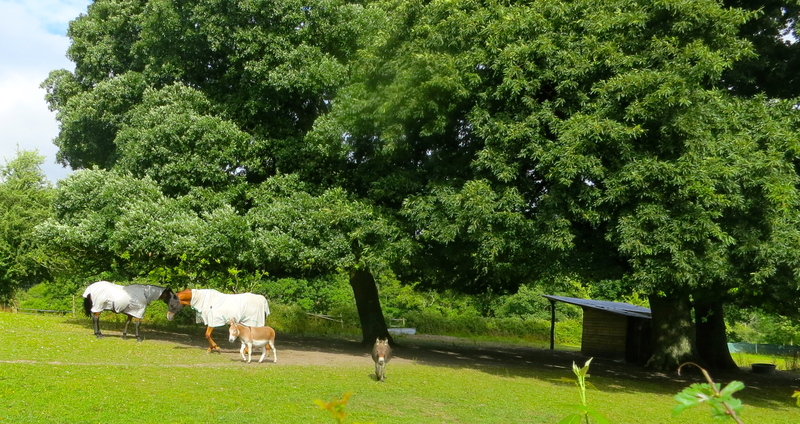 Tim also told me that the two goats and few sheep on his little farm are what might be called rescue animals. The goats were found abandoned as kids some fourteen years ago near Godshill; the sheep were ailing as lambs and bottle-fed in the same haven. I joked that if I found any stray creature in the forest I would know where to bring it. This afternoon was spent once again grappling with security problems with BT e-mail accounts. Firstly I received one of those hijacking missives purporting to come from someone in urgent need of money. Because the whole e-mail address of the sender is taken over by these evil scammers, any reply never reaches the alleged originator. It goes to the crooks. This happened to Louisa a year or so ago. Chris and Frances were said to have been mugged in Rome where the Embassy was unhelpful. Chris was visiting our mother in West End at the time. These messages are instantly recognisable firstly because anyone in such dire need would use the telephone, and secondly because the English is so appalling. Neither Louisa nor Chris would write so badly. The whole business is a dreadful headache for the true account holder, because it affects everyone in their address book. All contacts are lost. As I was contemplating the plight of my brother and sister-in-law I received an e-mail allegedly from Yahoo! Customer Care which seemed to me to be equally spurious and contained the usual booby-trapped ‘Click here’ message. It had not even been put into the Spam folder by BTYahoo! mail. I smelt a rat and phoned BT. When I finally got to an agent he said he didn’t deal with such technical matters and consequently put me in a queue for technical help. It took some time before I got a person, who didn’t know whether this latest message was Spam or not. After I read it out two or three times, pointing out the errors and where it didn’t seem to make sense, she decided it was more likely than not to be a scam. She advised me to put it into the Spam folder and send it to abuseadbt. I asked if that was all one word and we managed between us to establish that it wasn’t. The ad bit was the symbol @. When I asked how I was now to have any faith in BT security she told me that she herself had been unable to receive messages for six months because she had been hacked and her password rejected, until suddenly it was accepted again. This failed to reassure me. 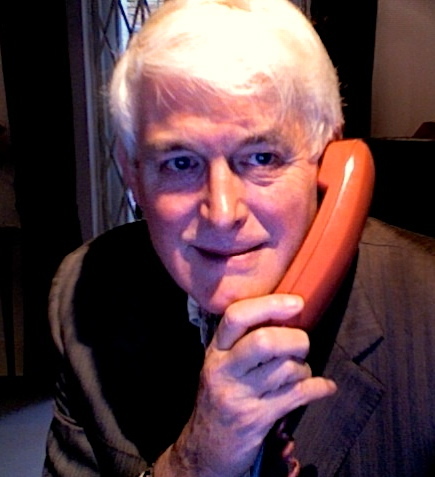 I had opted to take part in a telephone survey after the call. It consisted of a triple choice questionnaire, 1 for good, 2 for bad, 3 for unsure; followed by an opportunity to make recorded comments about why I had scored it as I did. I took the opportunity. In the midst of this, despite the repetition of how important and helpful my views would be, I must have run out of time, for I was cut off in full flow. It was a machine that conducted the survey. I don’t think it was programmed to register when it has interrupted the customer and call them back to offer more time. Either that or I upset it when I mentioned that a difference in accents of spoken English makes for a certain difficulty in communication. I am not convinced of the security of my e-mail account. I cannot understand how the survey as performed can be of benefit to anyone. BT, if you read this, I am open to all attempts at reassurance on either matter. Of all the different varieties of fuchsia Jackie has been growing in her pots, the one the blooms of which she has most eagerly awaited is named ‘Holly’s beauty’ (otherwise known to her as Orlaith). This has come into its own today. This evening we dined on Jackie’s chilli con carne and pilau rice. My drink was Chilano cabernet sauvignon 2011 and Jackie’s was Hoegaarden.